Bahamas wedding locations throughout our islands are all special and and ever so charming. Hurricane Matthew recently passed through the Bahamas. Our capital, New Providence, Nassau, North Andros and Grand Bahama were affected most. Nassau is open and welcoming visitors, hotels operating and cruise ships calling on the port. 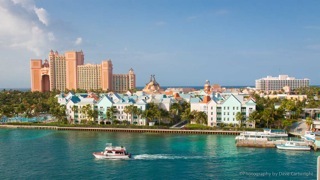 Major hotels such as the Atlantis and Melia Beach Resort continue to operate and welcome guests. The country’s second city, Freeport, Grand Bahama, though hit by the hurricane, has commenced its clean-up. Power has been restored to essential services, hotels and some residences. Work is moving rapidly. Grand Bahama’s Lighthouse Point at Grand Lucayan Golf and Beach Resort reopens November 7th. Pelican Bay Hotel is open as are its restaurant, Sabor and bar, Bones. A number of attractions and restaurants are up and running, too. In addition, a number of wonderful Bahamas wedding resorts are open and ready to host you and your destination wedding guests. Many of these islands and resorts were untouched during the hurricane. Among the islands untouched are The Abacos, The Exumas, Eleuthera, San Salvador, South Andros and Bimini. We’ve hosted two Nassau weddings in October. And, we’re delighted that we’ve been able to help several brides relocate their events in Nassau. Our next event takes place November 5 at Sandy Toes, a private island off Paradise island. We’re excited! The Bahamas Ministry of Tourism reported that on Wednesday, October 19, a couple from the United States headed to Andros, along with 160 of their closest friends and family, to say ‘I do’. The wedding would caused the first influx of visitors to Andros since the passage of Hurricane Matthew, and was touted as “a huge event” for the island. The lovely Abaco Inn in Hope Town, Elbow Cay, Abaco, pictured above, accommodates wedding groups of up to 50. Take this venue as an exclusive for just you and your guests. You’ll certainly be glad you did. Chic Bahamas Weddings is now booking 2017 and 2018 destination weddings Bahamas. W’re more than happy to help you plan your Bahamas wedding. Contact us today to begin planning your.